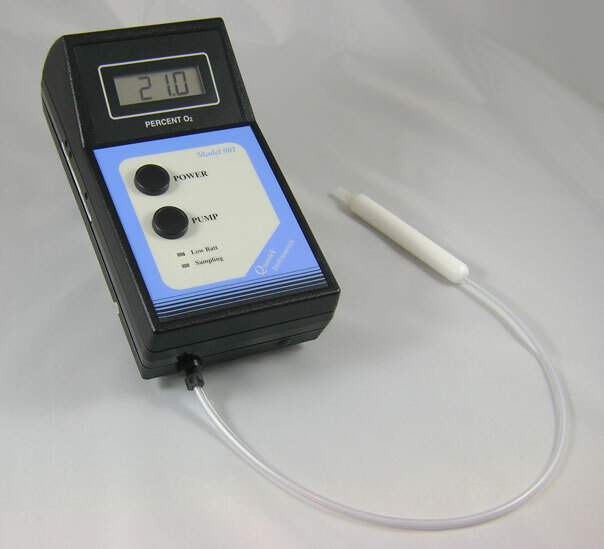 The Quantek Model 901 is a battery-operated, portable headspace oxygen analyzer. Other headspace analyzers require a new sensor every 1-2 years. But our flagship headspace oxygen analyzer, which is used by small and large food packagers, producers, and quality control personnel throughout the world. Use it in the lab, or on the packaging line. Non-technical personnel will find it very easy to use – and at less than 3 pounds, it can be easily transported to other locations. The sample probe is tipped with a filter and needle. Simply affix the foam septa to your package, insert the needle through the septa, and press the pump button. Sample is drawn through the probe and into the internal oxygen sensor. The residual oxygen concentration displays within 15-20 seconds. The Model 901 oxygen analyzer is the market leader for durability, simplicity, and reliability. The initial lower cost, and longer-life sensor, makes it the industry leader in handheld portable headspace oxygen analyzers. The sensor is unaffected by high levels of background gases such as nitrogen or carbon dioxide, and unaffected by trace hydrocarbons. You can use the Model 901 for applications where oxygen level is very high (50 to 100%) without overloading the sensor. The expected electrochemical sensor life is typically 5 years, unlike other analyzers with an electrochemical sensor that last 1-2 years. Sample with confidence using our liquid blocking filters – all contamination is blocked from entering the analyzer, reducing downtime significantly. Accuracy: +/- 0.1% (below 10% oxygen).